A team of chemists investigated ginger’s impact on bad breath and found that 6-gingerol is able to increase the enzyme sulfhydryl oxidase 1 in saliva very quickly– in fact, 16 times over in just a few seconds. 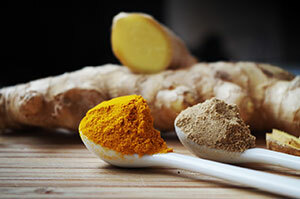 Scientists have also looked at ginger’s ability to reduce motion sickness. Motion sickness is caused by conflicting sensory signals being sent to the brain, and while there are a lot of remedies for this problem on the market today, ginger is one of the all-natural remedies that has other valuable health benefits as well. In fact, studies have shown that taking just two capsules of powdered ginger versus taking a placebo delays the onset of motion sickness at about twice the rate. There are many forms of ginger available, such as tinctures, tea, powders, oils, capsules, and foods derived from the ginger root. However, capsules with “super-critical extraction” are the best and most effective because they give you the effects of the purest ginger and will give you the greatest effect.